Bring the “greasy spoon” into your kitchen! Or living room, because we all know that’s where you eat. Everybody loves a really good greasy spoon. They are part of the fabric of America. Sadly, they are also kind of dying. Or rather, maybe not exactly dying but reinventing themselves, like Madonna. Not that I’m complaining, per se. I do prefer non-smoking establishments, fresh wallpaper and clean restrooms with toilets that don’t leave a little flurry of paper in them after you flush. At least one thing about the beloved diner hasn’t changed: the food. Sure, our horizons may be slightly broadened. (Enter what I call the “Greeksy spoon,” which pretty much offers all the typical fare plus gyros and salad.) 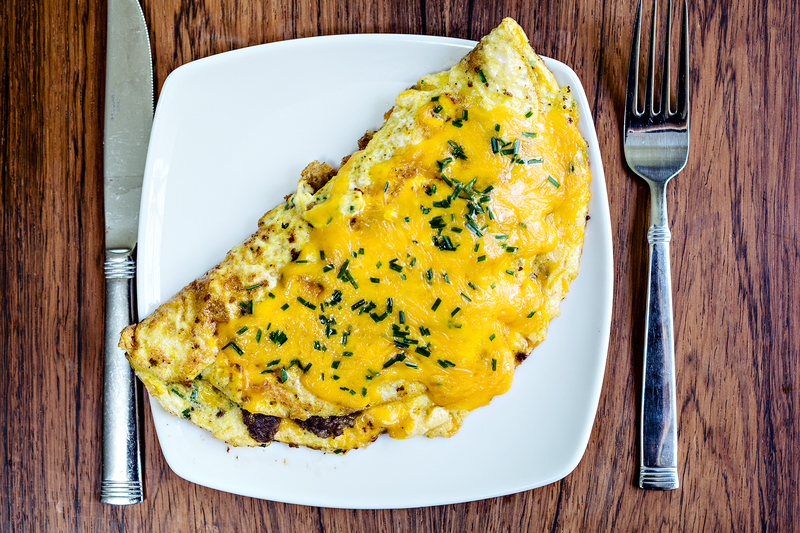 The menu may shift and sway, but it always dons one mainstay: the omelette. You can fill it with vegetables, name it after a city, and cover it six ways to Wednesday in cheese. For a little bit of that diner experience from the comfort of your own sticky kitchen (or coffee) table, here are a few tips. There’s no reason to make it hard on yourself. Use a non-stick pan and a lot of oil/pan spray/grease. If you’re filling it with bacon or sausage, make sure to cook the omelette in the meat grease, as much as you can bring yourself to leave in the pan. Put a little bit of grated parmesan in the beaten eggs. I think it helps the whole thing hold together a little better. Keep the heat on medium-low (about a 3 to a 4) and let it sit until the eggs are mostly set. Then fill it and fold it over. If you have to, set a timer for 5 minutes and sit on your hands so you aren’t tempted to mess with it. It won’t burn because you have it on medium-low. I think this goes without saying, but only put the fillings on half of it. The half you’re not planning on folding over. I like the double-spatula method. Use a spatula (like the rubber one you would lick cookie dough off) and a spatula (like a pancake flipper) to gently lift one side of the omelette over the fillings. Use a lot of cheese, and make sure to set some aside to melt right on top. This is very important in case something goes wrong with the delicate process of folding it in half, resulting in a tear. The melted cheese will hide any rips and tears. Heat the oil in the pan over medium-low heat. Pour in the beaten egg and parmesan mixture with salt and pepper to taste. Let sit until the eggs are set but still wet, at least 5 minutes. The eggs should not be runny. 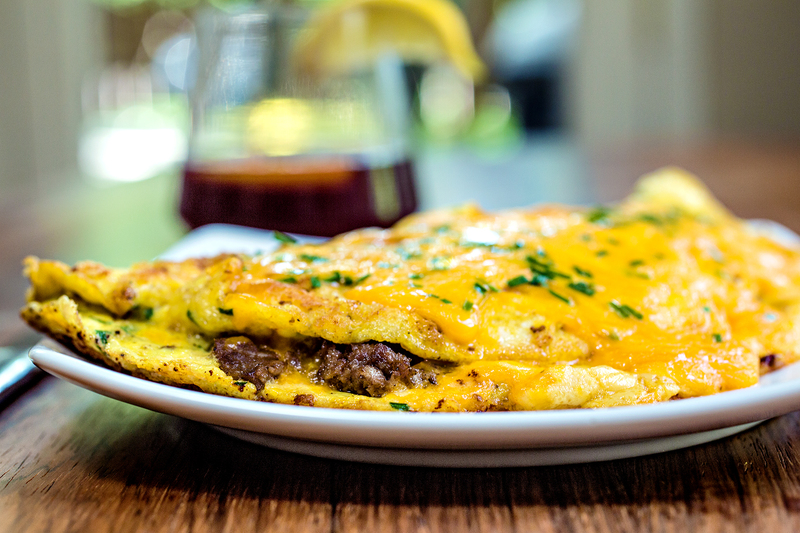 Once the eggs are set, add the sausage and cheese to one-half of the omelette, reserving a little cheese to melt on top. Very carefully fold the other side of the omelette on top of the fillings. Sprinkle with the remanin cheese and chives and cover until the cheese on top has melted. 1 Comment on "How to make a diner-worthy omelette"
Your narratives are always so interesting. Especially liked this one. Made me smile and reminisce.